Excellent stay, way better than a hotel and way better than we expected! This is an excellent place to stay, we come back again and again! You get exactly what you expect based on the description, and you get it with a smile! Dolphin Inn South is a perfect spot for a quick weekend getaway. We have searched for that special getaway place for years. Lucie's cottage is that place. Great, will definitely seek to use the property again and would recommend to all my friends and family. This was our first experience renting from your company. We will be back next year without a doubt. Your office staff were so accommodating and friendly. I talked with them a number of times before we arrived and was always treated professionally and with kindness. Great people!! Your company is great to work with and we'll more than likely look at staying @ some of your other properties during our next visit. We have rented vacation homes through CBVR several times now, and each experience has been fantastic. The rental process is easy, each house exceptionally clean and well-equipped (we have stayed at 3 different properties), and each time both the process and the property were exactly what we expected - no unpleasant surprises! This is the second year I have used this company for our beach rental time in February. Both times, the office staff was more than friendly and very helpful! I love this company and all the houses that they have available. We will definitely keep coming back! :) Love, love, love Cannon Beach! Can't wait to come back - I've already booked my return visit! We love you and can't wait to return! We were very impressed with the team at CBVR. We received a warm welcome and great information. The welcome bag with coffee and mugs was a very nice touch. The service was excellent. We will definitely recommend you. Thanks! 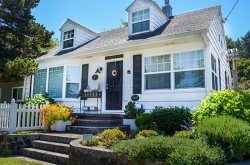 I originally thought the only thing important was the house itself - but I soon found out that what I was really getting for my money was the house and the Cannon Beach Vacation Rental staff. The staff is what really make things happen and can make the difference in the stay being mediocre or wonderful. Your staff is the best - they went out of their way on numerous occasions to help with any questions or needs. They are a team that's hard to beat, and they obviously enjoy their jobs! Everything was easy and enjoyable.